If you're looking for minibus hire in Yorkshire, look no further. Here at Barbus Travel, we are dedicated to getting you from A to B. Our experienced drivers will get you there on time in one of our 8 or 16 seater vehicles. Established in 2007, we take on all manner of jobs including contract work if required. Our minibus hire service is entirely flexible, catering to customers throughout York and the surrounding areas. We also complete airport transfers to all UK airports and seaports. 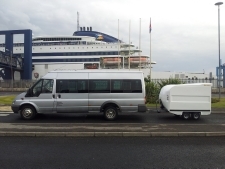 To discuss your requirements, call us on 07799 610009 or email barbustravel@aol.com for a free quote today. What can you expect from Barbus Travel? Copyright Barbus Travel 2019©. All Rights Reserved.